We really wanted to get this shirt for Oscar but they didn't have his size. Next candidate? Stewie! He forgets his pants all the time too! I really can't look at him in this without laughing. hee hee hee! I love this shirt! This is so funny! 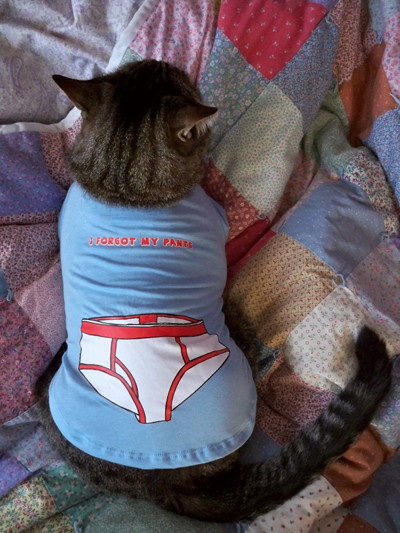 Cat's don't do pants! omg adorable...I cant believe he lets you do that to him...the only kitty that ever let me do it was Sushi, he had his little Carhartt jacket....id lose an arm..or worse if i tried it on any of the rest of the herd.